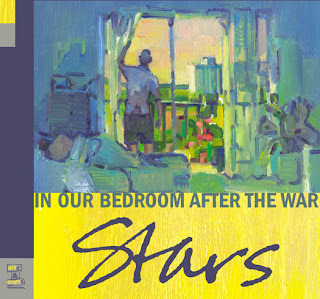 So it looks like the new album from the Stars 'In Our Bedroom After the War' got leaked way early. Wasn't due till late Sept so the band did what most artists should do nowadays. Release the album early! They released the whole album on Itunes only 4 days after completing it! Hey it beats all the bloggers out there posting bad copies and making some dough while their at it. Not to mention people getting bored of the album by the time it's actually released. Seems like the CD and album versions with the artwork won't be out till that Sept date but you can buy the whole thing on Itunes already. They did a great job with this album from the tracks I've heard so far. I always loved their dual male/female vocals but this one feel's like they've gotten better at what they do. More cohesive and beautiful! Check out these 2 new tracks... Plus a sweet Junior Boys Remix of an older track of theirs 'Sleep Tonight'.